McGuire continues to strengthen its unique support and sophisticated service offerings for both its agents and clients with the recent promotions of the company’s VP of Corporate Services, Content Strategist, and Mill Valley Office Manager. 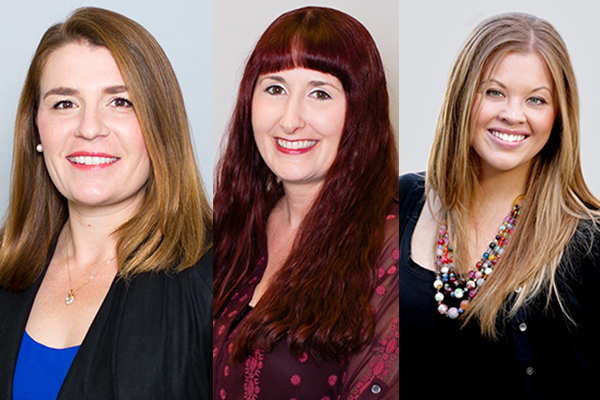 McGuire proudly names Lauren Bensinger, VP of Corporate Services; Kate Stephenson, Content Strategist; Marcella Tate, Mill Valley Office Manager. As a local, luxury boutique brokerage, McGuire takes a non-traditional and highly-personalized approach to furthering the success of its sales team. The company’s distinctive employee structure and culture of strength-based management provides mobility and innovative career paths, tailored to the individual’s talents and goals, of its dedicated support staff and leadership team. This creative and strategic approach to doing business is what allows McGuire to provide exceptional support that reaches beyond traditional real estate and delivers forward-thinking solutions for its agents and clientele. With that, McGuire Real Estate proudly names Lauren Bensinger as VP of Corporate Services, Kate Stephenson as Content Strategist, and Marcella Tate as Mill Valley Office Manager. Kate is responsible for all of the content seen and shared across the company’s websites, blogs, and social channels—assuring that McGuire and its agents’ content is current, relevant, and engaging for the consumer experience. Kate works with the Marketing and Leadership teams to develop integrated, strategic communications on behalf of the brand. She uses both traditional and digital media platforms to share McGuire’s story, promote its agents and listings, and provide trusted market insight to its many followers. By leveraging innovative technology like dynamic ads and mobile retargeting, Kate ensures that McGuire’s original content enlightens and entertains the brand’s new and existing audiences. McGuire’s Content Strategist plays a key role in engaging its consumer and increasing agent sales opportunities. As McGuire’s Mill Valley Office Manager, Marcella is responsible for day-to-day operations of the sales office, with an emphasis on personalized training and business development for the company’s agents. Marcella helps McGuire’s Marin and Sonoma County Agents increase their productivity by working with them to develop successful sales and transactional strategies, providing personalized training for McGuire’s innovative tool set, and cultivating intra-McGuire relationships throughout the Bay Area.